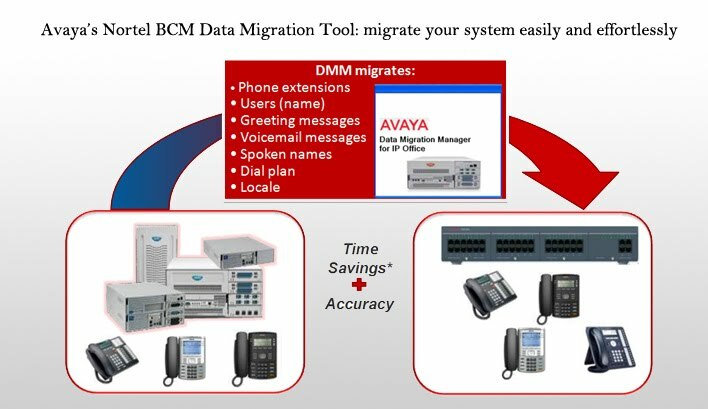 Avaya’s acquisition of Nortel in 2009 has resulted in the expected cancellation of BCM telephone systems in 2011, with migration into IP Office being the only stated way forward. As experienced IP Office dealers for over 5 years, Telephone Magic Inc. is in a unique position to help you transition to an Avaya IP Office IP500 phone system with the minimum of fuss. Phone systems can and do go wrong; vendors may not like to admit this but issues do occur. As a company critically dependant on communication with the outside world through your phone system, the last situation that you want to be in is being out of support on an end of life telephone system, with no facility for spares, repairs, vendor issue support etc. This is why we recommend to users that you should be no more than 2 versions behind the latest software and absolutely not on end-of-life hardware. With handsets being typically between 40 and 60% of the value of your existing handset, the ability to re-use these and gradually upgrade your BCM system at a steady pace avoids the rip and replace scenario which will inevitably ensue once it is end of life and spares/repairs become completely unavailable and critical issues start to occur. All extensions will be converted with one click, including voicemails brought over, and your users will need no additional training. Your users will then start to become acquanted with the IP Office software at a gradual pace, giving you scope to enlarge or upgrade further to, for example, IP Office IP telephony, when the time suits you, rather than as a response to issues. Avaya have developed a special centralized migration tool which transfers your handsets and voicemail over to IP Office 7.0. “Data Migration Manager”. Using a three step process namely Extract, Convert and Apply, all announcements, greetings and voicemail messages can easily be transferred, resulting in a significant reduction in installation times and cost. The tool supports Norstar v7, BCM200/400/1000 R4, BCM50 R3/R5/R6 and BCM450 R1/R5/R6 as source system, and it is expected that the tool will evolve to handle the extraction, conversion and transfer of Auto-Attendant customer announcements in the future. If your business has traditional phone system wiring, you can continue using it with your Avaya IP Office solution. If you have a Local Area Network (LAN) to connect your PCs/servers, you can use that instead. Avaya IP Office works with either kind of wiring—the choice is yours and the savings of using existing wiring are significant. Common wiring interfaces available with Avaya IP Office reduce the re-wiring often associated with replacement of a communication system—making the upgrade fast and easy. As your business grows, Avaya IP Office easily grows with you. There won’t be a need for another upgrade anytime soon. Avaya IP Office can handle hundreds of extensions. When you upgrade to Avaya IP Office, you can keep using your Nortel phones and replace them on an as needed basis. Or, make plans to equip select employees—executives, receptionists, sales and customer service reps, etc.—who can really benefit from the added features of the new Avaya IP phones or Avaya digital phones. Either way, by being smart and managing the use of your existing phones you can protect up to 60 percent of your initial investment and still gain the benefits of a new solution. This entry was posted in Avaya, avaya upgrade, migrate, Norstar phones, Nortel, phone system, support for nortel, telephone upgrade on May 6, 2011 by jjackson.